Great news – we’ve released new options on the Green Box Scheme for 2019! The Green Boxes have been extremely popular during the trial period and it’s a fantastic way to help reduce unecessary food waste whilst reducing your weekly shopping bill. 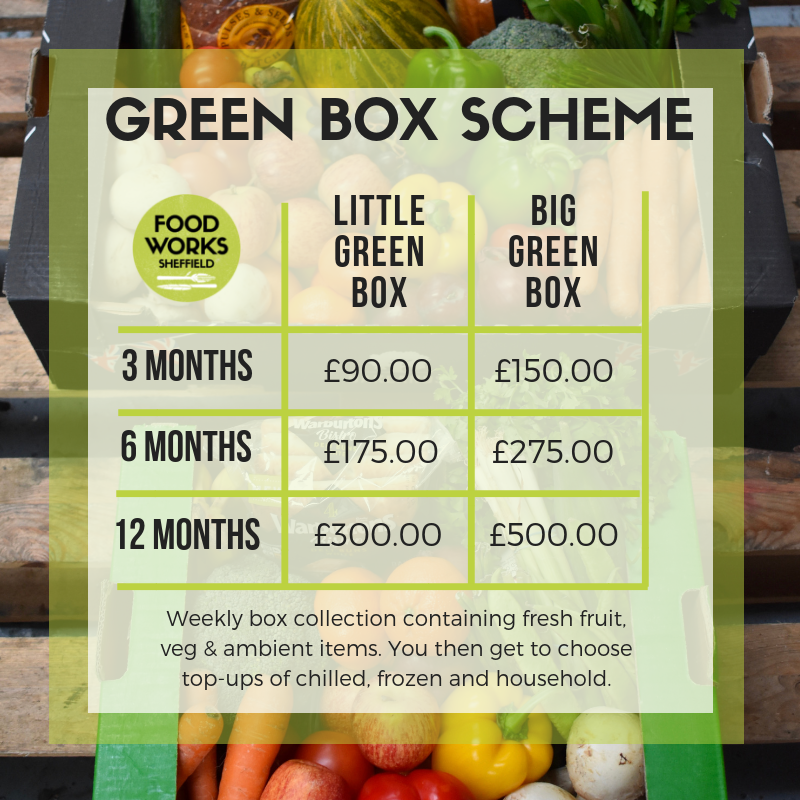 Originally the Green Box Scheme was available for 12 months however we’ve now launched both 3 and 6 month packages through the Crowdfunder. The box includes a weekly box collection of fresh fruit, veg and ambient items plus you top it up with chilled, frozen and household items. Don’t just take our word for how great they are…. Secure your box for 2019 via https://www.crowdfunder.co.uk/food-works-for-sheffield. debit card. If you require an invoice or other payment options this can be easily arranged. Thank you for helping make Sheffield a greener, more fair and more sustainable city! I’m about to buy a green box scheme, can I just check the times of picking it up? If I could do it post work? Hi Claire – it’s best to contact the team running the Sharehouse directly about this – they don’t manage the website.